Marg has the Mr Linky this week. With so much going on in my real life between preparing for my upcoming trip to Europe, working on the course I am taking, and talking to people about the career path I’m interested in, I have not been reading a lot lately. So many of the books I’ve picked up over the last few weeks are piled up on my desk, taunting me. And, rather than work through them methodically, I decided to pick up even more books and grow the pile. 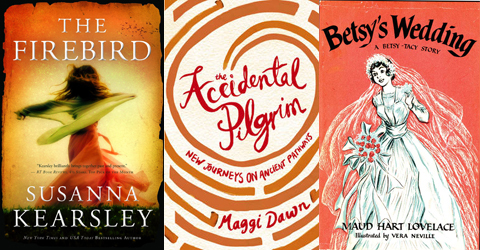 The Firebird by Susanna Kearsley – I discovered Kearsley last year, thanks to recommendations from many other bloggers, and read four of her books in quick succession. No surprise then, I was first in line for this newly-released title, which focuses on the Jacobite community in 18th Century Russia and a 21st Century English art dealer trying to track down the history of a small wooden carving of a firebird that might have once belonged to Empress Catherine. Betsy’s Wedding by Maud Hart Lovelace – as much as I haven’t been wowed by the two Lovelace books I have read (Emily of Deep Valley and Betsy and the Great World), I can’t resist finding out how Betsy’s story ends. At the Yeoman’s House by Ronald Blythe – my library is overrun with Blythe’s books and I have always wondered about them. 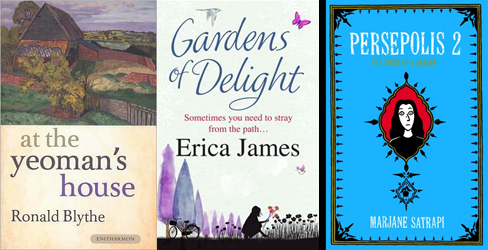 Gardens of Delight by Erica James – I am reading this now and it is kind of awful but in the semi-irresistible way of chick-lit. Persepolis 2 by Marjane Satrapi – I stumbled across my 2010 review of Persepolis a few days ago and, seeing this sequel on the library shelf, thought it was time to see how Satrapi’s story continued. It was the writing that really offended me in Gardens of Delight, rather than the subject matter. Enjoy the reading! Especially the Fire Bird. Betsy’s Wedding! I am awash in nostalgia! Read them all in middle school. Loved them. Don’t know how I would feel today. It has been interesting to read some of the Betsy-Tacy books and to try and figure out why people love them so much! I have yet to read a Kearsley book. I’ve picked them up from the library but haven’t actually cracked one open. Enjoy your loot! Thanks, Linda! I do hope you get to try Kearsley one day (my favourite, so far, is The Shadowy Horses). I was looking at Sea of Poppies but, knowing how many books I already have checked out and how soon I’m leaving town, practiced incredible restraint and left the library without it. Hope you’re enjoying it! I have been keeping an eye out for the Firebird but its still not available here in the libraries. I would so like to read The Ac cidental Pilgrim. Sounds really good. Also not available. It will come eventually! I was #1 on the library hold list for The Firebird! One of the benefits of reading Canadian authors is that sometimes, as here, their books are released in Canada first. Jealous the new Kearsley is already out for you! I hope the wait isn’t too long for you before it comes out in the US, Eva! 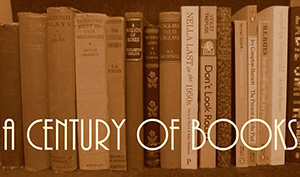 Yes, the proper response to a growing pile of to-reads is always to check out more! I’ve enjoyed some James, some Betsy, and some Persepolis, so it looks like a good week for you.